Even in the context of the bizarre, twisted fairy tale of Michael Jackson's life, the time he spent living in a converted cowshed in rural Ireland shortly before he died takes some believing. But in the summer of 2006, after his acquittal in the previous year's court case, having left Neverland and spent some time in Bahrain, the King of Pop secretly arrived in County Westmeath with his children. Relieved he had found a sanctuary away from the paparazzi and enchanted by an area so rich in history, myth and folklore, Jackson ended up staying for the rest of the year. I've been given some odd assignments by the Observer, but none quite so off the wall as sleeping in what used to be Michael Jackson's bed, after discovering that the Irish country homes he stayed in are now available to rent for weekend breaks. Grouse Lodge is a secluded Georgian estate located down an unsigned, winding, potholed gravel drive near the village of Rosemount. It was converted into a residential recording studio in 2002 by owners Paddy and Claire Dunning, and has been used by everyone from REM to Doves, Muse to Ms Dynamite, Snow Patrol to Shirley Bassey. Paddy is a modern-day renaissance man in his mid-40s whose life at times seems only slightly less fantastical than Jackson's. He started out as a Dublin dustman and became one of the founding fathers of the resurgence of the Temple Bar district of the capital. Now his Dublin businesses include Temple Lane Studios, the Sound Training Centre, the Button Factory nightclub and The National Wax Museum Plus. In 2006 a woman called Grace Rwaramba arrived to check out Grouse Lodge studio for an unnamed A-list pop star. She liked what she saw and booked the studio plus a three-bed cottage on the grounds that had been converted from a cowshed. But she still didn't reveal who the artist was. Paddy and Claire only discovered the identity of their new lodger when a bus turned up and out trooped Prince Michael Junior, Paris and Blanket, followed by their father Michael Jackson, nanny Grace and the children's tutor. Grouse Lodge is set around an old farmyard, and there's a collection of converted outbuildings that form a second grassed courtyard, none of which is visible from the road, so it's not hard to see why Jackson felt safe and secluded here. He began work on new material at Grouse Lodge with Will.I.Am and Rodney Jerkins, producers who flew in from America. Jackson fell in love with County Westmeath and, after a month in the converted cowshed, moved to the equally secluded neighbouring estate of Coolatore, also owned by the Dunnings. Because Jackson didn't have his own driver in Ireland, Paddy enlisted local taxi driver Ray O'Hara to drive Michael and the kids around in a borrowed people carrier with blacked-out windows. The Dunnings somehow managed to keep the fact that the King of Pop was in residence a secret for several months. Even when Jackson began to venture out and there were rumoured sightings of him in the nearby villages of Moate or Kilbeggan, the Dunnings would deny all knowledge. "If someone said to me I've heard Michael Jackson is there, I would tell them: 'Yeah, so is Elvis Presley!' says Paddy. The only security Grouse Lodge arranged was to post three guards on rotation at the top of the drive to intercept unwelcome visitors. When word eventually began to leak out, locals in the know became protective of Jackson, sending reporters the wrong way, and one farmer even threatened to empty his slurry trailer over the car of a paparazzo. The Irish Midlands are often overlooked by people rushing from Dublin to Galway or other parts of the west coast, but it's a magical land dotted with ringforts and medieval castles. Within a few miles of Coolatore are the twin historic hills of Cnoc Aiste and Uisneach; there's Lough Ennell and Lilliput, where Jonathan Swift first conceived Gulliver's Travels (Paddy is planning on an eco village in woods near Lough Ennell, along with a seven-storey model of Gulliver); and Locke's Distillery in Kilbeggan, now a museum. There are also a few local pubs that haven't changed for decades, such as the William Fox in Loughnavalley, and Gunnings in Rathconrath, which doubles as shop, newsagent, garage and community centre. Traditionally, the hill of Uisneach is the geographical centre of Ireland. It's only 600ft high, but from the top you can see 20 counties on a clear day. It was the ancient seat of the kings of Meath, the most sacred site in the world in Pagan times, and home of the ancient festival of the fires, Bealtaine, which attracted Egyptians up the Shannon 2,000 years ago. It's also home to the Cat Stone (or Stone of Divisions), said to be the burial place of the goddess Ériu (who gave her name to Ireland, or Eire) and where the ancient provinces of Ireland were divided. Uisneach is now part of the farm belonging to David Clarke, and on 1 May this year, Clarke and Paddy organised the first Festival of the Fires for more than 1,000 years, attracting a diverse mix of locals, farmers, clairvoyants, witches, wizards and gurus from far and wide. A beacon was lit on Uisneach, sparking a chain of fires on 73 different hills across the country, from Dingle to Donegal. "Michael was interested in history," says Paddy, "and smitten by the intricacies of Irish music." The Dunnings have a wealth of stories from the time they spent with Jackson. "One night we ended up in the studio," Paddy recalls. "Michael was on the drums, I was playing guitar and [American producer] Nephew was on the keyboards and we just started getting a rhythm together, and slowly but surely Nephew just creeped the song in to 'Billie Jean'. It was just mad playing 'Billie Jean' with Michael Jackson – I never thought I'd do that." Paddy is a natural raconteur. He tells me how, when he bought the Wax Museum Plus – Dublin's answer to Madame Tussauds – the resident Elvis was looking a little tired, so Paddy retired him, placing him in the woods by Coolatore. He had forgotten about him until Michael Jackson came in from a walk one day looking shaken. "Paddy," he said, "I just met my father-in-law in the woods!" The waxwork Elvis in the woods. Towards the end of his stay in Westmeath, Jackson started to look at prospective houses to buy. 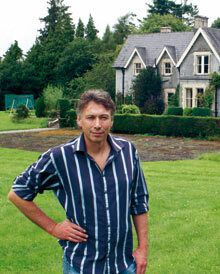 When the Dunnings bought a further property, Bishopstown House, a derelict Georgian estate a mile or so away, Jackson visited it and discussed the renovations with Paddy. So, although it would be a little disingenuous to call Bishopstown the House that Jacko built, it's certainly the house built with Jacko in mind. Jackson had a base in London for his ill-fated 50-date run of gigs at the O2, but according to Paddy he also planned to spend time in Ireland, escaping the media glare of the English capital. Both Coolatore and the newly converted Bishopstown are now available for hire. Coolatore is the larger estate of the two – a beautiful 1866 Victorian country retreat with long halls and vaulted ceilings, grand living and dining rooms, a library and a hidden staircase that leads down to a basement bar installed by the Guinness family. Bishopstown, having been derelict for years before the Dunnings took it over, has been converted in a much more contemporary style, with a wood- clad extension added to the original Georgian house, along with a secret fourth-floor roof garden, designed to afford Jackson panoramic views of the countryside without being seen himself. Both houses have six bedrooms and five bathrooms. The houses are rented primarily as self-catering properties, and if you use all the available beds, they can work out costing €100 a night each. It is also possible to have meals supplied by nearby Grouse Lodge (they can also arrange everything from massages to clay pigeon shooting), with menus focusing on local produce and vegetables grown in their own walled garden. Claire and the staff at Grouse Lodge cooked for Jackson, who favoured a simple, healthy diet of porridge for breakfast and main meals of fish or chicken with vegetables. "The guy was fit – he was getting stronger," Paddy says, "and I reckon if he had lived here and stayed here, he wouldn't have died." That was truly an enjoyable read. Loved the part where Michael met his father-in-law in the woods, ha! Having spent time in Ireland, I can understand why Michael loved it so much. The friendliest people I've ever met in this great big world live in Ireland. I wish Michael had retired in Ireland. I also feel he would still be alive if he had. Thank you. BTW, here is a link to some beautiful photos of Grouse Lodge. reading this story I wonder michael and his sons walking freely in this place should be a paradise, well at least he found some peace in this place.thanks for posting! Thanks for sharing these pics. A very lovely place. No wonder he liked it.